DVDs are quite sensitive and even a slight damage will ruin the DVD movie. If you have a large collection of DVD movies, you must want to make a digital copy of DVD so as to backup them in digital format in case your discs get damaged or destroyed. After converting DVD to digital videos in formats like MP4 or MOV, you won’t need to worry about the damage of the DVD disc anymore and can watch DVD movies on mobile devices like iPhone, iPad, PSP and more or even share them online. Then here comes the question: How to convert DVD to digital copy? To get the answer, just read on to learn how to make a digital copy in video formats of DVD. The recommended helper is Aimersoft DVD Ripper, which is an excellent DVD to digital converter. With it, you can fast convert DVD to MP4, MOV, MKV, FLV, WMV, AVI, etc. with custom settings. In addition, lots of video presets for portable devices like iPhone, iPad, iPod, etc. are provided to let you get videos to fit a certain device. If you're a Mac user, simply turn to Aimersoft DVD Ripper for Mac, which lets you turn DVD into digital copy on Mac OS X (Mountain Lion and Mavericks included). Now download this program and follow the steps to finish your work. The process of converting DVD to digital copy will be easy as pie if you follow the simple step-by-step guidance below. Just note that the screenshots are taken from the Windows version of DVD converting program. Please make sure you’ve downloaded the suitable version before you start. Launch Aimersoft DVD Ripper and insert the DVD disc you want to convert into your computer's hard drive. Then click Load DVD to import the DVD movies into the program. After the files are loaded, you can select your preferred subtitle and audio track. If there are many titles, you can click Merge into One File to rip DVD into a single video file. Next, click Profile to choose an output format. As you can see, you can either choose a video format as the output format or simple select the icon of a device to get videos with optimized settings. To extract background music or soundtracks from DVD, just choose audio format as the target format. And click Output to set a folder to save the converted video files. Tip: If you want to play DVD with Windows Media Player, you can choose WMV as the output format. 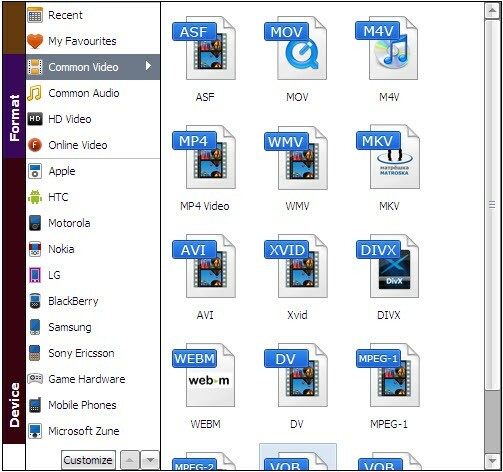 To play DVD videos on iPhone/iPad/iPod or Android mobile phones, choose the optimized preset for them. For editing video with Apple iMovie or Final Cut Pro, MOV or M4V should be the best choice. When all settings are done, click Start to begin converting DVD to digital copy with your desired format. When the conversion finishes, click Find Target to locate the ripped videos and enjoy them anywhere you want.